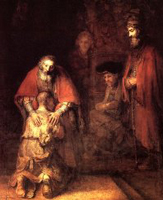 This is an excerpt from The Return of the Prodigal Son by Henri J.M. Nouwen. I thought it was appropriate for the beginning on Lent and wanted to share it with you all. The greatest challenge of the spiritual life is not to love God, but to allow ourselves to be loved by Him. Not to ask for forgiveness, but to let go of our sins and allow ourselves to be forgiven. This Lent, through fasting and prayer we reflect on the emptiness of our lives without God. Let us also reflect on His great mercy and forgiveness and his desire to love us lavishly. I have been seriously neglecting Path to Holiness lately. I’ve been torturing myself with politics and trying to keep up writing on Reflections. I hope to spend more time on both blogs and less time obsessing over politics. God bless you all this Lenten season!